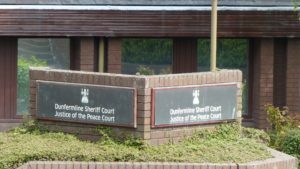 A Dunfermline teenager, who attacked his pregnant girlfriend by kicking and punching her, has been sentenced to 13 months in custody. The assault was carried out by serial offender Reigh Braidwood (19), of Shields Road, who appeared from custody at Dunfermline Sheriff Court. He was sentenced for a catalogue of crimes going back to 2016. He had been given the chance of community-based orders, which he then breached. Braidwood previous admitted violence against his partner committed on 20th May last year at Ogilvie Street, Dundee. He shouted, swore and repeatedly made abusive remarks towards his then partner, who was pregnant. He then assaulted her by kicking her on the head and body. He also assaulted her by throwing a remote control at her. Braidwood further admitted that having been granted bail at Dunfermline Sheriff Court on 3rd August not to contact his ex-partner, he breached this condition on 12th September by sending social media messages. Braidwood was also sentenced for a list of previous offences. On 4th February 2016 at Shields Road he assaulted a 14-year-old boy by punching him on the head and body. On 7th November 2016 at Woodwill Road, Dunfermline, he shouted, uttered offensive remarks and acted aggressively towards his partner. On 27th August 2017 at Shields Road, he repeatedly shouted, swore and threw household items. On 1st April last year at Wardlaw Street, Cowdenbeath, he made aggressive gestures, shouted and made a threat of violence. On 11th May he breached a bail condition not to enter Cowdenbeath. Braidwood is currently in custody in respect of other allegations. Sheriff James MacDonald sent Braidwood to the young offenders’ institute for 13 months.